Gold production of 36,600 ounces, on track to achieve the previously stated 2019 guidance range of 145,000 to 160,000 ounces. Mining rate averaged 61,542 tonnes per day. The decrease in the mining rate compared to the fourth quarter of 2018 can be attributed to the completion of the Phase 3 pit at Rory's Knoll. Record quarterly mill performance of 7,213 tonnes per day. Strong balance sheet with an unaudited cash balance of approximately US$73 million at March 31, 2019 and total debt balance of US$35 million. Issued updated Mineral Resource and Mineral Reserve estimates, and life of mine plan "LOM plan" on the Aurora Gold Mine. Continued its corporate restructuring in Guyana and at Head Office and significantly strengthened its Board and Senior Management. 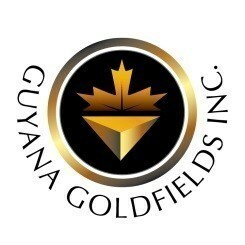 TORONTO, April 15, 2019 /CNW/ - Guyana Goldfields Inc. (TSX:GUY) (the "Company") announces its operating results for the first quarter 2019. Full first quarter 2019 operational and financial results will be released after-market on Tuesday, April 30, 2019 with a conference call held on Wednesday, May 1, 2019 at 10:00 am ET to discuss the results. Scott A. Caldwell, President & CEO stated, "Management is developing an optimized production schedule that will, among other things, reduce the stockpile build up that is currently part of the new LOM plan. Moreover, management has identified several additional cost savings opportunities not captured within the new LOM plan that will improve operating and financial flexibility." "Looking ahead, we expect to set a new and higher standard in our operating performance and provide consistent results based on our new resource model. We have continued to strengthen our Board and senior management and have brought on proven expertise to assist with our operating plan." In the first quarter of 2019, the Company significantly improved mining and milling volumes compared with the prior year. This improvement allowed the Company to partially offset the negative impact of a higher strip ratio and a lower head grade compared to the first quarter of 2018. Gold recovery averaged 90.5% for the quarter, compared with 91.7% a year earlier. The Company completed the mill expansion which is anticipated to enhance capacity and redundancy of the primary crushing circuit and expected to further lower per unit costs. On January 14, 2019, the Company stated that first quarter gold production would be similar to its fourth quarter 2018 production of 42,750 ounces, based on the now obsolete 2012 resource model. A full reconciliation analysis of the model, mine and mill grades will be presented with the quarter end results. The Company's balance sheet remains strong with an unaudited cash balance of approximately US$73 million at March 31 and total debt reduced to US$35 million. Under the current terms of the loan agreement, the Company is scheduled to make seven additional quarterly payments of US$5 million to retire the debt at the end of 2020. The Company is reviewing options to restructure debt in order to boost its financial flexibility. Roscoe Postle Associates Inc. ("RPA"), the author of the updated LOM plan which was completed in March, recognized and pointed out that the production plan was not optimized due to time constraints. In addition, Management has identified a number of additional opportunities to enhance its corporate business plan that fell outside the scope of the RPA study. The Company expects to complete and announce its optimized plan in conjunction with its first quarter financial and operating results after-market on April 30, 2019. Smooth out the open pit mine plan to lower the stripping requirement in 2020 and extend the pit life. Optimize the underground development plan focused on extending the ramp up period over a 3-year timeframe to better align with the open pit schedule and reduce the volume of stockpiled ore suggested in the LOM plan schedule. This will reduce the front end capital, lower operating costs and enhance cash flow generation during the transition period to full scale underground mining. Tangible opportunities identified to further reduce operating costs by approximately 10% through renegotiation of existing supplier and procurement contracts. Establish a strategic mining alliance into a single operating unit, improving operating efficiency, management focus and reducing overhead costs. Incorporate results of restructuring site employees and Guyana office replacing 14 expatriate positions (30% of total expatriate staff) with locally skilled workforce. Potential to supplement the production profile by development and test mining at Mad Kiss and East Walcott during the exploration phase of the underground. Identify, upgrade and incorporate satellite open pit resources into the mine plan from Aleck Hill, Aleck Hill North, West Mad Kiss and Walcott Hill. Reduce working capital requirements for the operations. The Company will host a teach-in technical workshop for analysts and institutional investors on Wednesday, May 1, 2019 at 1:00 pm ET to discuss the results of the optimization initiatives. The accompanying presentation will be made available on the Company's website under the Investors tab and within the Events & Presentation section at www.guygold.com. For further details on this event, contact Jacqueline Wagenaar, VP Investor Relations, at 416-933-5485. Work on the underground decline will resume in the second quarter. The contractor will complete and reinforce the collar at Mad Kiss and extend the exploration decline 200 metres to fulfil the scope of the early works phase. The Company expects this work will take approximately three months to complete once the contractor is fully mobilized. A budget of US$2.0 million has been approved for the early works phase. The Company's permit allows for test mining of up to 350,000 tonnes that could potentially provide supplemental mill feed during the development period and further unlock value at the Aurora Gold Mine. In addition, the underground exploration ramp will allow the Company access to perform infill drilling at depth to delineate exploration targets and potentially add mineral resources, as well as convert mineral resources to mineral reserves and further unlock value by potentially prolonging the mine life at the Aurora Gold Mine. Management's intention is to develop an Underground Technology Centre, with a purpose of educating and transferring skills and technology required in all areas of underground technology. The Company is finalizing the review of bids received for the underground development contract with the target of final award in the second quarter of 2019. The Company is continuing its near mine exploration efforts and has a planned drill campaign utilizing two surface drill rigs to test down plunge extensions of the high-grade mineralization reported in 2018. The Company allocated $6.8 million in 2019 for additional surface brownfield drilling, initial underground exploration drilling and the resumption of greenfield exploration for a combined total of approximately 30,000 metres. On April 4, 2019, a group consisting of senior Guyana Government officials and media visited the Aurora Gold Mine. The tour successfully met its key objectives, highlighting the safety and well-managed operations while familiarizing key stakeholders with the opportunities that lie ahead if and when the Company obtains a permit for underground mining. The Company has submitted an application for an underground mining permit to the Guyana Geology and Mines Commission. If approved, the Company proposes to commence commercial underground mining in 2022. Underground operations would be expected to add 300 people to the current work force of approximately 720. A conference call will be held on Wednesday, May 1, 2019 at 10:00 am ET to discuss first quarter 2019 operational and financial results. A recorded playback of the call will be available until Wednesday, May 8, 2019 by dialing: 1-888-390-0541 or 416-764-8677 and entering the call back passcode 739789. This news release contains "forward-looking information" which may include, but is not limited to, statements with respect to unaudited financial results, optimization work, and underground exploration decline timeline. Often, but not always, forward-looking statements can be identified by the use of words and phrases such as "plans," "expects," "is expected," "budget," "scheduled," "estimates," "forecasts," "intends," "anticipates," or "believes" or variations (including negative variations) of such words and phrases, or state that certain actions, events or results "may," "could," "would," "might" or "will" be taken, occur or be achieved. Forward-looking statements are based on the opinions and estimates of management as of the date such statements are made and are based on various assumptions.